WEMPE ship clocks have been manufactured for many decades and are used all over the world. They do not only sail the seven seas aboard ships, they are also decorative elements in offices and private rooms. The company has 110 years of expertise in the field and produces ship clocks in long-standing tradition. The technology with the battery-powered quartz movement, on the other hand, is up-to-date. 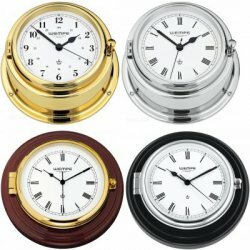 The classical design is expressed in the practical toggle clasp: the ship clock can be opened to the front and the batteries can easily be switched. Choose a ship clock from the WEMPE SKIPPER or BREMEN II Series that are available with either colourlessly lacquered or chrome plated brass housing. The BREMEN II Series can be ordered with Roman or Arabic numerals.